As TADHack Global approaches, we wanted to present some challenges to developers, to give you some tangible problems to consider solving with your hacking efforts. With this in mind, TADHack Brisbane Location Leader Mark White sat down with Michael Mersiades, picture below, founder of social enterprise ChatLoop. MW: Michael, tell us about ChatLoop – what it is, and why you came up with the idea. One of the greatest hurdles refugees face when learning the language of their new communities is finding someone to practice the language with. Someone who will listen patiently, speak slowly, with simple words and grammar, on a regular basis, at a convenient time and place. Chatloop connects refugees to volunteers through a messaging app for some convenient, communicative language practice. They connect to partner, and together they work through a communicative language activity, such as a game of 20 Questions. They play slowly, only sending one or two messages a day, so that the learner gets a consistent drip-feed of language practice. When the activity is finished, they connect to another partner for another activity. When I was living abroad, I promised myself that I would help refugees learn English once I returned to Australia. However, once I arrived back in Australia, a rapidly filling schedule and the lack of a car prevented me from keeping my promise. I felt disappointed, but I consoled myself by telling myself that “volunteering is impossible for busy people like me”. A while later, I was turning over in my mind the idea of “speed-dating for language learning, using text messages” when it struck me: this could solve my volunteering problem. Busy people could volunteer from their phones, at just 5 minutes a day, from wherever they happened to be. And that’s when Chatloop got started. MW: How did you get ChatLoop started? I decided to test out the idea by using WhatsApp, my myself and Google Sheets working in the background to manually connect the learners and volunteers in WhatsApp chat groups. That pilot program is still going on today, and the learners and volunteers have completed over 850 Chatloop activities. Churn rate amongst the learners has been much lower than you would expect for a language learning app, and very few volunteers have dropped out at all. Rather than piloting Chatloop in isolation, I’ve been talking to refugee settlement support organisations to learn about how to work with refugees. I’ve signed MoUs with the Australian Red Cross in Queensland and Asylum Circle (and in discussions with many more organisations) because they’ll be referring refugees and people seeking asylum to Chatloop. I’m currently participating in ilab’s Germinate startup accelerator program at the University of Queensland. I’m using the three months of the program to ramp up towards a crowdfunding campaign. MW: What, or whom are you looking for through participating in TADHack Global? Chatloop is going to be an amazing journey, with the potential to have a positive impact on the lives of millions of people. But I don’t want to go on this journey alone. I’m looking for a kick-arse software developer to join the founder team. Chatloop is going to be a sustainable social enterprise, and I have plans for generating revenue while keeping Chatloop free for refugees and volunteers. Our primary goal will be positive social impact, rather than making billions of dollars, so any potential co-founder’s values would need to align with that. I’m hoping that collaborating with TADHack will raise awareness of Chatloop within the global TADHack community, and perhaps a developer will see the potential of Chatloop and talk to me about joining the team. There’s also another reason for collaborating with TADHack. Although a messaging app for “speed-dating for language learning” seems like a pretty simple app to build, there are actually quite a few interesting little technical challenges that are going to arise in the medium term. I have my own ideas about how to solve them, but I’d much rather draw on the collective expertise and creativity of the telecommunication app developer community! Thanks Michael! If you think you would be interested in maybe building a prototype for ChatLoop before or during TADHack Global using the sponsors’ technologies, make sure you register for TADHack at any of the locations including remote. 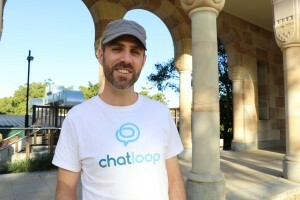 If you want to learn more about ChatLoop, visit their website at chatloop.io and/or contact Michael on Twitter at @ChatLoop1.